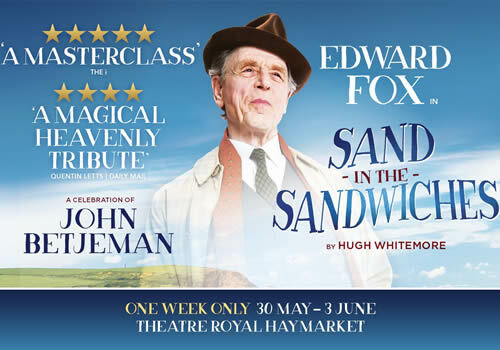 Following a hugely successful UK tour in 2016, Edward Fox revives his role in a transfer of Hugh Whitemore’s play Sand in the Sandwiches. Playing at the Theatre Royal Haymarket for a strictly limited weeklong season, the production will continue on a UK tour after its West End run in May. Edward Fox once again takes on the role of John Betjeman, in a one-man play that celebrates the life and works of the former poet laureate. Featuring verse by the poet, Sand in the Sandwiches takes the audience on a journey through Betjeman’s childhood to becoming one of Britain’s best loved writers, in a highly entertaining stage production. BAFTA winning actor Edward Fox is best known for his extensive film career, with roles in British films such as A Bridge Too Far, The Go-Between and Oh! What a Lovely War. Sand in the Sandwiches is written by Hugh Whitemore, whose previous plays include Pack of Lies and Breaking the Code. Sand in the Sandwiches is directed by Gareth Armstrong and opens at the Theatre Royal Haymarket for a limited week season, whilst The Goat, Or Who Is Sylvia? takes a short break. The production features design by Fotini Dimou, lighting design by Howard Harrison and sound design by Simon Slater. Opening at the theatre on May 30th, Sand in the Sandwiches plays until June 3rd 2017. Sand in the Sandwiches is not suitable for young children, due to adult content and sexual references.